Utilising artistic techniques to create a personalised tool kit for stress. 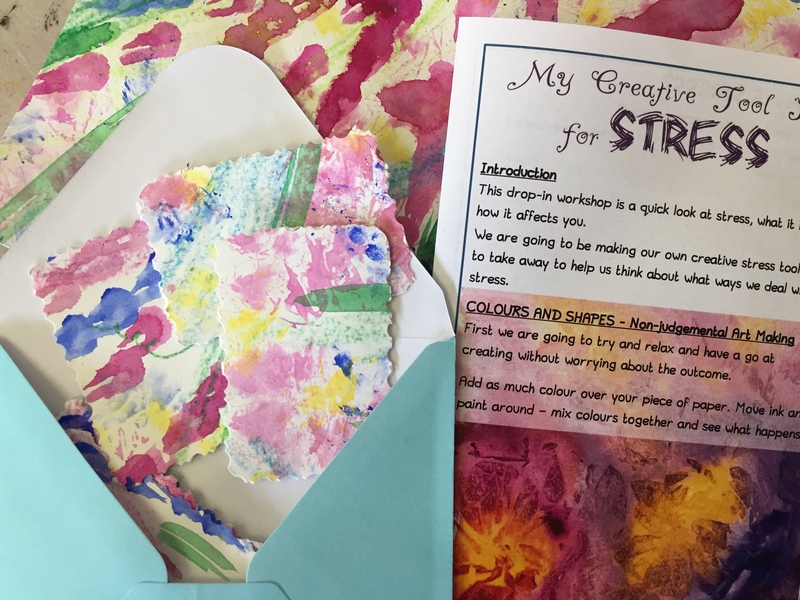 Our Art for Wellbeing practitioner, Stacey Coughlin, led a session of non-judgemental art making which led transforming an experimental art piece into a structured tool kit for coping with stress. This workshop was in response to Mental Health Foundation's awareness week this year, 14th-20th May 2018. The theme this year was stress and whether we, as a society, were coping. We wanted to open up conversation for people in the Rochdale Borough to identify what stress is for each of us and how we can manage it. "Relax in a chair and listen to your favourite music"
"Call a friend who makes you feel better"
"Dance or sing as though no one is around!" After the creative session on Friday 18th May, everyone who attended reported that they felt more confident in expressing their creativity, they felt the session had a positive effect on their wellbeing and the activities were enjoyed all round. We've used a similar workshop for professionals to support in the understanding of self-care when working in supporting roles. So we are well on our way to tackling stress for the public and in the work place. Look out for your chance to get involved and create your own tool kit or contact becky@cartwheelarts.org.uk for a bespoke workshop.